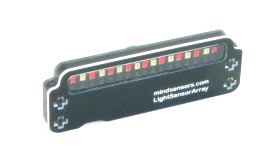 O sensor Segue Linha é um array de 8 sensores com controlada fonte de luz, retornando valores do sensor para seguir linhas, superfícies com cores diferentes, etc. A nova Bola de Infravermelho da HiTechnic é perfeita para jogar futebol de robôs ou para ser usada como um objeto a ser caçado. A bola bem balanceada oferece 20 LEDs de infravermelho, dando cobertura total de sinal, além de ser compatível com o padrão da RoboCup Jr. A bola pode também pode operar em modo modulado (com pulsos), que é o padrão da RoboCup Jr. antiga. Dois modos adicionais, 1200 Hz e 600 Hz, dão a possibilidade de aumentar o alcance do sinal (de 5 metros ou mais). Os sinais IR modulados por pulso tornam a bola mais fácil de ser detectada em ambientes com pouco iluminação, uma grande vantagem em relação as versões anteriores. O modos pulsado também aumenta o tempo de vida das baterias. Play robot soccer and zero in on your infrared (IR) beacons with the new and enhanced IRSeeker V2 (Version 2). You can use most TV remotes and LEGO® Power Functions remotes as beacons that the IRSeeker V2 will detect. With a specially designed curved lens and five internal detectors, the IRSeeker V2 has a 240 degree view making it perfect for playing robot soccer with the HiTechnic IRBall. The IRSeeker V2 has enhanced modes that detect modulated IR signals, including the new RoboCup Jr stepped modulated mode, and it filters out background signals giving superior performance in brightly lit rooms and sunny locations. The sensor returns the signal direction and strength making it easy to locate and gauge the relative distance to the target. A winning robot soccer combination when combined with the HiTechnic NXT Compass Sensor! The NXT IRSeeker V2 (Version 2) is a multi-element infrared detector that detects infrared signals from sources such as the HiTechnic IRBall soccer ball, infrared remote controls and sunlight. It is perfect for robot soccer competitions. Modulated (AC) Mode - The sensor will detect modulated IR signals such as those from the HiTechnic IRBall or some IR remote controls. In Modulated mode the sensor will filter out most other IR signals to decrease interference from lights and sunshine for example. The sensor is tuned to square wave signals at 1200Hz. Un-modulated (DC) Mode - The sensor will detect un-modulated IR signals such as older style IRBalls or sunlight. The IRSeeker V2 uses advanced digital signal processing techniques to filter the signals received and select only the signals required. A newly designed housing with a constant radius curved end cap increases directional peformance by minimizing distortion of light signals entering the sensor. The IRSeeker direction values are shown here with 1 indicating the infrared target is left and behind, 5 if the target is directly ahead and 9 if the target is to the right and behind. A value of 0 is returned if no signal is detected. All IRSeeker V2 functions can be accessed using the MINDSTORMS NXT-G programming block that can be downloaded from the download page. The number shows which of your NXT's ports are connected to the IRSeekerV2. You can change this number in the configuration panel if you need to. Choose the port where your IRSeekerV2 is plugged in. By default, the block will be set to port 1 for an IRSeekerV2. You can change this selection if you need to. Chose the Mode. Two modes are available Modulated (AC) and Un-modulated (DC). Un-modulated (DC) Mode - The sensor will detect un-modulated IR signals such as the older style IRBall or sunlight. You must click on the Data Hub to open it as shown. This plug wires the number of the port that the IRSeekerV2 is connected to. This plug outputs the direction value. This plug selects the mode the sensor is operating in, 0 = Modulated Mode (AC), 2 = Un-modulated (DC) mode. This plug outputs the source detected logical value. This plug outputs the Channel 1 signal strength value. This plug outputs the Channel 2 signal strength value. This plug outputs the Channel 3 signal strength value. This plug outputs the Channel 4 signal strength value. This plug outputs the Channel 5 signal strength value. The five strength values available make it possible to determine the approximate distance to the infrared source if it is of a known brightness. The five strength values come from five infrared sensors which are oriented to face in the 1, 3, 5, 7 and 9 directions. Internally, the sensor will interpolate the readings between these five primary directions to obtain the direction values 2, 4, 6 and 8. Using infrared remote control as a signal source: Most remote controls will be detected by the IRSeekerV2 in AC mode but some remotes may not be detectable, depending on the signal generated. The IRSeekerV2 is tuned to detect a 1200Hz square wave. The new IRSeeker requires the new V2 version NXT-G programming block that can be downloaded from the download section of our web site. NXT Firmware version 1.05 or later must be loaded in the NXT for the IRSeeker V2 and other digital I2C sensors to operate correctly. You can check the firmware version by displaying the NXT Window in the Mindstorms software. The I2C address of the IRSeeker V2 sensor is 0x10. For a complete list of HiTechnic API supported by NXC, please refer to the HiTechnic API page of the online NXC Programmer's Guide. All IRSeeker V2 features are available in RobotC using the functions provided by the drivers pack available under RobotC below. This is a new block for the IRSeekerV2. The block uses a combination of AC and DC modes for improved short range direction and signal strength determination without sacrificing long range performance. 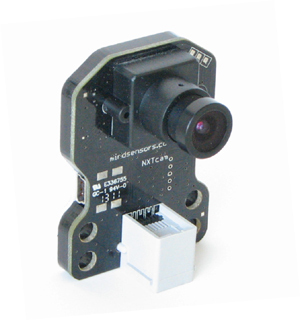 This NXT-G block supports the new IRSeekerV2 (Version 2) Sensor. The IRSeekerV2 has enhanced features to detect modulated and un-modulated IR signals. This block provides features enabling access to the direction and relative strength of an infrared signal. Two NXT-G sample programs for the Enhanced IRSeekerV2 block. ViewEIRSeeker simply displays the values from the sensor on the NXT screen while MoveEIRSeeker drives the robot toward the IR source. The HTEnhancedIRSeekerV2 function implements the same algorithm as the Enhanced IRSeekerV2 Block. This function uses both AC and DC modes for enhanced short range IR direction determination and signal strength. Ideal for WRO Football Robots. LabVIEW 2009 VIs and sample program VIs for the sensors commonly used by FTC teams. This set includes VIs for the Acceleration, Compass, Gyro, IR Seeker V2, and Magnetic Sensors as well the Touch Sensor Multiplexer. These VIs support the HiTechnic Sensor Multiplexer. See included readme.txt file on how to install into LabVIEW 2009. IR Seeker V2 Sensor VIs and sample program VI for LabVIEW 2009. Supports the HiTechnic Sensor Multiplexer. See included readme.txt file on how to install into LabVIEW 2009. LabVIEW VI for the HiTechnic IRSeeker. Note: This vi is designed for LabVIEW 7.1 with NXT Toolkit. This sensor block will replace the current V1 and V2 IRSeeker sensor blocks. This block has a mode selector that lets you choose between three V2 modes (AC 1200Hz, AC 600Hz, and DC) as well as V1 sensor mode. Expand your NXT experiences with the new NXT Compass Sensor and add accurate navigation to your Mindstorms® NXT projects. The NXT Compass Sensor is a digital compass that measures the earth's magnetic field and outputs a value representing the current heading. The magnetic heading is calculated to the nearest 1° and returned as a number from 0 to 359. The NXT Magnetic Compass Sensor updates the heading 100 times per second. The Compass Sensor operates in two modes, Read mode and Calibrate mode. In Read mode, the current heading is calculated and returned each time to the NXT program executes a read command. In Calibrate mode the compass can be calibrated to compensate for externally generated magnetic field anomalies such as those that surround motors and batteries, thereby maintaining maximum accuracy. The NXT Compass Sensor contains a digital magnetic compass that measures the earth’s magnetic field and calculates a heading angle. The Compass Sensor connects to an NXT sensor port using a standard NXT wire and uses the digital I2C communications protocol. The current heading is calculated to the nearest 1° and refreshed 100 times per second. The Compass Sensor is housed in a standard Mindstorms sensor housing to match the other Mindstorms elements. The compass can be programmed using LEGO Mindstorms NXT Software Compass Block*. If the Compass Block is not available you may also use the standard Ultrasonic Block. *Note: The NXT Compass Block can be downloaded by going to the Downloads page. If using the Ultrasonic Block to program the compass, configure the block to centimeter mode as shown. The Ultrasonic Block can only return values from 0 to 250 so in order to return the full range of headings, 0 to 360, the heading value returned when using the Ultrasonic Block will be the current heading divided by 2. For example, if the current heading is 220°, the value returned will be 110. North will return a value of 0, East, a value of 45, South, a value of 90 and West, a value of 135. To get the actual magnetic heading, simply take the number returned and multiply by 2. The Compass Block is designed to support the HiTechnic Compass Sensor and supports all compass features. 1. This plug wires the number for which of your NXT’s ports are connected to the compass sensor. 2. This plug wires the number of the Action to be performed. 3. This plug wires the Target heading, see section on Relative Heading further down this page. 4. This plug wires the lower limit number for the Inside/Outside compare function. 5. This plug wires the upper limit number for the Inside/Outside compare function. 6. This plug outputs the current Absolute Heading number. 7. This plug outputs the current Relative Heading number, see section on Relative Heading further down this page. 8. This plug outputs the Inside/Outside logical value. Port allows you to select the NXT port the compass is plugged into. Relative Reading: Allows you to set a Target and read the Relative Heading (Plug 3 and 7 on the data hub). See Using Relative Reading below for more information. Calibrate: Set the compass sensor into Calibrate mode allowing you to go through the calibrate sequence to minimize the influence of metal and other other sources of magnetic interference such as motors or batteries. See Calibrating the Compass Sensor below for more information. Compares the Absolute Heading to the range set and sets the logic value to show if the value is inside or outside the range. See Using Range below for more information. Relative Reading makes it easy to stay on a selected heading. To use this feature select the Relative Reading action. Then enter a Target that is the heading you wish to maintain. If you wanted to navigate South, you would enter a Target of 180 (South is 180 degrees). The Compass Sensor block would then calculate the difference between the Absolute Heading and your Target and return the difference as the Relative Heading. (plug 7). For example, with your target set to 180, if the Absolute Heading were 175, then the Relative Heading would be 5 (Target – Absolute Heading or 180 – 175 = 5). This indicates a turn to the right or clockwise of 5 degrees is required to get back to the Target. If the Absolute Heading were 185, then the Relative Heading would be -5 (Target – Absolute Heading or 180 – 185 = -5). This indicates a turn to the left or clockwise of 5 degrees is required to get back to the Target. The HiTechnic compass sensor will be influenced by local magnetic interference in the same way as any other magnetic compass. Objects such as metal items, motors, batteries and wires can cause magnetic interference. Local magnetic interference may cause the compass to output a heading several degrees different than the actual magnetic heading. This is called compass deviation. To correct for deviation, the HiTechnic compass sensor has a built in calibration function that calculates correction offsets and stores them in the compass. Calibration is optional and usually not required for normal operation. To minimize the need for calibration make sure you mount the compass at least 4 – 6 inches (10 – 15 cm) away from the NXT and NXT motors. To calibrate the compass under program control, select calibration mode (value 2 wired to the Action plug input) and then program your robot to rotate (turn in a tight circle) between 1 ½ and 2 times (more than 360 degrees) so it completes a full turn in about 20 seconds. Once the turns have been completed, set the Action to a Read function (Absolute or Relative) and the compass will be calibrated. The compass will retain the calibration settings until another calibration is performed, even if it is unplugged. The Compare lets you set a range and easily determine if you are inside or outside the range. Inside Range / Outside Range: Select if you want to test for an Absolute Heading inside the range or outside the range. To use the Range function, set the lower and upper limit of your range and whether you want to test for inside or outside the range. Examples showing the logical result. The Sensor version number field will report a revision number in the format “²Vn.m” where n is the major version number and m is the revision level. Revision numbers will typically reflect the firmware level. The version number will be used to indicate the hardware level. The Manufacturer field will contain “HiTechnc”. The Sensor type field will contain “Compass”. The Mode control field may be set to 0x00 or 0x43 to define measurement mode or hard-iron calibrate mode. The Heading fields will return the currently measured heading during measurement mode operation. During hard-iron calibrate mode operation, this field will jam. Heading = (two degree heading *2) + one degree adder. If the sign is a problem, then the conventional 16 bit value can be obtained from 0x44 (low byte) and 0x45 (high byte). 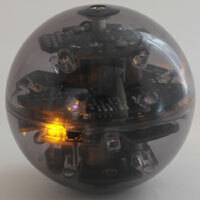 All features of the HiTechnic Compass can be accessed using RobotC. For more information go to http://www-education.rec.ri.cmu.edu/robotc/. Next Byte Code (NBC) is a simple programming language that can access all compass features. For more information go to http://bricxcc.sourceforge.net/nbc/. The HiTechnic compass sensor will only operate correctly in a horizontal plane so you must keep the compass level for it to read correctly. This is very important so remember this when you build it into your robot. NXT Firmware version 1.03 must be loaded in the NXT for the compass to operate correctly. You can check the firmware version by displaying the NXT Window in the Mindstorms software. It is highly desirable to mount the compass at least 6 inches (15 cm) away from the motors and 4 inches (10cm) away from the NXT brick itself. Try to make sure it is firmly mounted, if it bounces around, the readings may bounce around too. 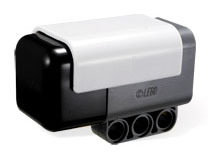 The Compass Sensor Block adds support for all Compass Sensor features to the LEGO MINDSTORMS NXT Software. This block gives access to features enabling Compass calibration, target heading and in/out of range and others. New with version 2.1: Fixes a bug preventing entering Calibration mode. You can now tell if calibration succeeded or failed by examining the absolute heading after calibration. This block supports for the HiTechnic Sensor Multiplexer as well as data logging with the LEGO Mindstorms 2.0 Education software. Compass Sensor VIs and sample program VI for LabVIEW 2009. Supports the HiTechnic Sensor Multiplexer. See included readme.txt file on how to install into LabVIEW 2009. LabVIEW VI to access the HiTechnic Compass Sensor in the NXT Toolkit. This Vision Subsystem has realtime image processing capability to detect and track line or upto 8 colorful objects. Note: Using NXTCam requires fair amount of programming expertize and analytical skills.